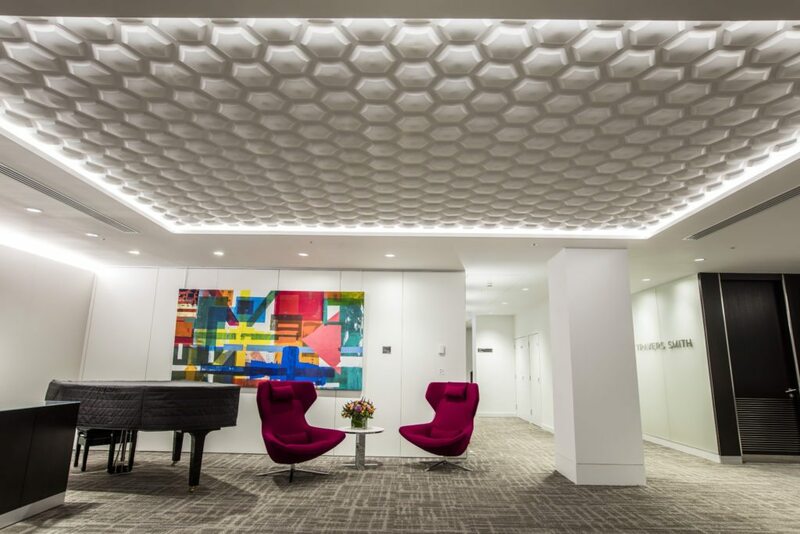 The Surfaceform Hexagonal Relief was applied in a ceiling context across four levels to include: 4 reception areas and meeting room spaces. 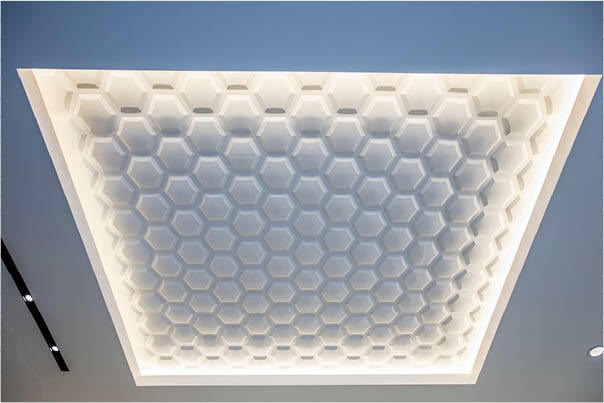 The relief was placed in enclosed ceilings, with mood lighting to highlight the various raised surfaces within the pattern, this offers the opportunity to add a unique and bespoke focal point to a room of any use. 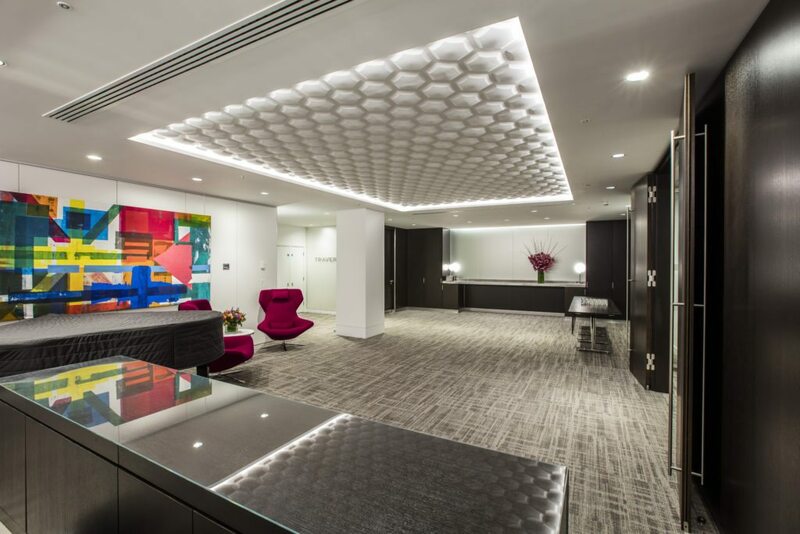 Surfaceform Plaster Relief is a range of high quality, artistic wall relief, seamless surface finishes, intended for internal use in commercial and domestic buildings. Combining traditional craftsmanship with the latest design and manufacturing techniques, we provide high-quality plaster surface as expected from our customers. Our imaginations are unleashed by the freedom of three dimensions; we take our inspirationfrom the world around us. Whether it is the random shapes of a Causeway block or the rich colours and absorbing patterns of a traditional brick wall, our installations reflect the wonder of life itself. 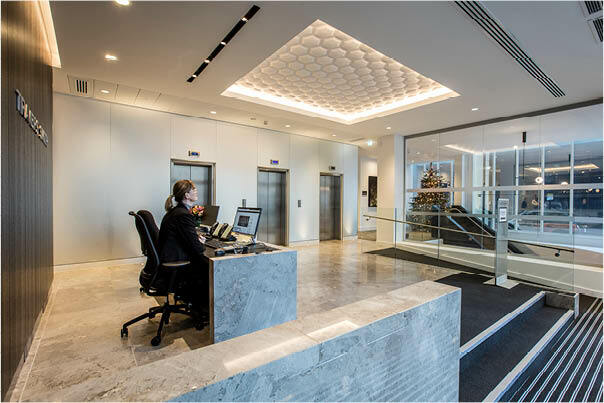 In 2017 Surfaceform have a few very exciting projects lined up which will push the company’s creative abilities and technical skills, to create the innovative and quality finishes that our customers have become accustomed to. To Keep up to date with current projects please visit our website’s Latest News page and follow us on our Facebook & Twitter account.